Most of my opinion of MGMT can be summarized by a YouTube video I found when I was on a Talking Heads kick that portrays Wesleyan students Andrew VanWyngarden and Ben Goldwasser covering “This Must Be the Place (Naïve Melody)” in what seems to be an impromptu concert outside their dormitory back in 2003. Although their performance comes off as amateur, at the very least it’s hard not to find endearing. Here are two liberal arts kids playfully displaying some good taste, good intentions and nice synth equipment, but not taking themselves too seriously. Even though the execution isn’t necessarily there, that feels ok.
Over the next five years Andrew and Ben would develop and release the electro-pop smash Oracular Spectacular as MGMT. And although clearly they had polished up their act a bit, many of the same qualities that made them appealing in that video contributed to their very successful debut. They couldn’t really sing. They wore silly outfits. But in a time when many other electronic groups were trying to be avant-garde, they wrote simple but incredible synth-hooks to songs about growing up that evoke a sense of nostalgia to those that have already been there, done that, and are relatable to those on their way. And lyrics like “We’re fated to pretend” indicated they still didn’t take themselves too seriously, which meant we still didn’t have to either. All we had to do was enjoy them, and ourselves, for what they were. 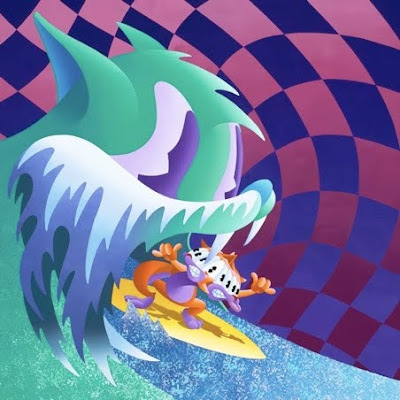 In other words, if MGMT wanted to continue to be successful post-Oracular, they had their work cut out for them with what is already one of the most daunting tasks in music: the sophomore follow-up to an iconic debut. Would MGMT end up making what equates to a B-sides release of Oracular, good but too similar to warrant any special praise, like The Strokes and Interpol had done with Room on Fire and Antics? Would they lose their identity by trying something completely different and falling on their faces like the Killers had done with Sam’s Town? When it was announced that MGMT was releasing their follow-up album Congratulations as a “no singles album”, not releasing or promoting particular tracks and instead encouraging a more “individualistic” exploration of the album, most immediately feared the worst. Not only did it just seem like a poor marketing strategy for a band who had achieved success by writing catchy singles that America’s youth rallied had around as anthems, but it was hard not to be skeptical that a “no singles album” really meant “there are no songs on this album good enough to be singles.” Such a stunt seemed the equivalent of the film industry practice of not pre-screening movies that are so bad they will undoubtedly get lampooned by critics, thereby delaying a negative buzz. Perhaps lowering expectation was part of the strategy, and if so it worked, because otherwise I don’t know if I would have made it through the first two dizzying tracks of Congratulations. On “It’s Working”, over-dubbed staccato vocals (and is that a French accent?) delivered over frantic synths and harpsichords had me convinced that I was listening to Air-on-crack or a post-punk rendition of Rolling Stones failed space-rock excursion Her Majesties Satanic Request. These themes continue on “Song for Dan Treacy”, as MGMT straddles a kind of awkward line between prog and glam that sometimes sounds like bad Bowie. If you listen closely at points you can even hear the goblins from Labyrinth doing background vocals. Congratulations closes with the title track, although this tranquil song centered around a catchy vocal melody is barely indicative of the rest of the album. That also happens to make it far and away the most accessible song on Congratulations, and perhaps also its best, but unfortunately not nearly flashy enough to make it a good single. This relaxed endnote could be deciphered as a sigh of relief, and over a lackadaisically pounded bass drum and lightly strummed acoustic guitar, VanWyngarden sings, “All I need’s a great big ‘Congratulations’,” which he deserves for this challenging but worthwhile album. Although I highly doubt that in the closing weeks of 2019 we’ll see this sophomore effort on anyone’s list for albums of the decade, by no means does that make it a failure. The imperfections are there, and sometimes glaring, but under extreme pressure to deliver MGMT has attempted something starkly different from their debut, something that challenged expectations of them, and manages to escape largely unscathed. And while that might sound like a back-handed compliment, it's certainly not meant to be. If anything, it took this highly skeptical critic and made a believer out of him. While observing someone being “naïve” can, in some cases, be endearing, as it was when watching Andrew and Ben cover an appropriately titled song as college kids, so can watching someone mature and develop beyond childish notions. MGMT has grown up, and it’s time we begin to take them seriously. A couple weeks ago someone sent me the below video the band The Whitest Boy Alive performing live in Berlin in 2008. Though I hate the name (did you ever notice the direct positive relationship between number of words in a band’s name and band name lameness? ), they've got a nice energy and it’s worth checking out. If you’re familiar with the band Kings of Convenience, the vocals of lead singer Erlend Øye will be instantly recognizable. The reason I mention it, though, is because of the awesome mash-up of the same song with Daft Punk’s “Harder, Better, Faster, Stronger” - one of the best I've heard. For someone whose solo career lasted only just shy of a decade, and who never released an album on a major record label, Elliott Smith has amassed a surprisingly large and dedicated following. The allure of his compositions is undeniable, his early albums dwelling on the beautiful simplicity of acoustic guitar and vocals in the vein of Nick Drake, but with the raw, lyrical honesty of Leonard Cohen; on his later works these would explode outward with pop brilliance reminiscent of the Beatles and vocal harmonies that even Brian Wilson could appreciate. As someone who once worshipped the ground that Elliott walked on, I’ve come to notice two things that even devoted fans generally don’t seem to know about Smith. The first is how to spell his first name correctly (it’s two LLs and two TTs people, honestly). The second is that before becoming a solo artist Elliott Smith did belong to a band, the Portland-based group Heatmiser, his tenure with which coincided with, if not directly influenced, the development of his brilliant solo career. For die-hard Smith fans, watching this development can be a fascinating and enlightening experience. Heatmiser was co-founded in the early 90’s by Smith and classmate Neil Gust while the two were still attending Hampshire College in Amherst, Massachusetts. A grunge band, it was only natural for the group to move out to Portland after graduating. There they would release three albums: Dead Air (1993), Cop and Speeder (1994) and Mic City Sons (1996). It was during that time that Smith began to emerge as the skillful song-writer we all know and love, both with Heatmiser and on the side in his solo career. The first album in Heatmiser’s collection, Dead Air is a pretty clear-cut grunge album; it’s raw and aggressive, and if someone played it for you without telling you, you might not know that Smith was even playing on it at all. Smith would later express discontent at these early years, describing the band’s repertoire as “loud rock songs with no dynamic” and complaining that he “couldn’t come out and show where [he] was coming from.” One can’t help but think that this disappointment fueled Smith to exercise a bit more influence in composing songs for the next album, and he begins to reveal small hints of his genius on Cop and Speeder. Speeder is still pretty grungy, but it’s here that we find Smith’s influence apparent on the song “Something to Lose,” as well as on Heatmiser’s first unmistakably “Smith” track, the oddly titled “Antonio Carlos Jobin,” the most (and arguably only) subdued song on any either of the band’s first two albums. In the meantime Smith had also begun releasing his own solo material, including the almost exclusively acoustic Roman Candle (1994) only a few months prior to Cop and Speeder, followed shortly after by the like-minded but more ambitious self-titled Elliott Smith (1995). By the time Heatmiser was constructing their final album Mic City Sons, Smith’s hand in the song-writing was clearly a heavy one, and I’d be only half-joking if I referred to it as “The Lost Elliott Smith Album,” in my opinion a must listen for any serious Smith fan. Regardless of the fact that it’s just a very good album all around, at least five tracks are obviously Smith’s work: “Plainclothes Man”, “The Fix Is In”, “You Gotta Move”, “See You Later”, and “Half Right.” All the facets of his style are evident here: the trademark layering of vocal harmonies, often to create a baroque-esque quality, the characteristic guitar strumming and chord progressions, and the minimalistic bass and drum lines that allow Smith’s distinctive voice and dual melodic acoustic and twangy electric guitar playing to always be the focal point. Interestingly, while any of those Sons songs would easily sound at home on his heavier, electric solo albums like XO (1998) or Figure 8 (2000) which would come later in his career, they were markedly different from the solo work he was actually producing at the time. Unlike on Roman Candle and Elliott Smith, on which Smith was mostly recording alone at home with a four-track, the songs played with Heatmiser were recorded in a studio with a complete band; not only are these some of his best composed songs, but they are also some of his best produced. Smith had a band in Heatmiser, a band which he had clearly become the star of, and he wasn’t afraid to exercise that influence. It was that lack of fear that led to the band breaking up before Mic City Sons was even released, as tensions grew over Smith’s blossoming solo career. Obviously, and sadly, with Smith’s premature death in 2003 and the releases of the posthumous album From a Basement on a Hill (2004) and the B-sides/unreleased collection New Moon (2007) in its wake, it would seem that pretty much all of the material Smith recorded has now been made available to the public. For people looking for more of Smith’s sound, exploring his influences on the music he made with Heatmiser is a rewarding experience well worth the effort. For my money, Heatmiser’s studio album Mic City Sons is an even more interesting and fulfilling Smith album than New Moon, whose songs are good but generally “more of the same” of the early acoustic album sessions from which they are taken. Below is a music video of the Heatmiser song “Plainclothes Man” from Mic City Sons, which I recently discovered on YouTube, and which to my surprise (as per the logo in the bottom left) apparently once aired on MTV2. There are gems of Elliott like this out there, so if you’re adamant about it, keep looking. Whatever we manage to find, though, it will never be enough to make us feel better about the loss of a great artist. In fact, it will surely only make us miss him more.